Now when he had ended all his sayings in the audience of the people, he entered into Capernaum. And a certain centurion’s servant, who was dear unto him, was sick, and ready to die. And when he heard of Jesus, he sent unto him the elders of the Jews, beseeching him that he would come and heal his servant. And when they came to Jesus, they besought him instantly, saying, That he was worthy for whom he should do this: for he loveth our nation, and he hath built us a synagogue. What do we know about this centurion in Capernaum? We know that he is a good master of his own household. Centurions commanded 100 Roman soldiers and were wealthy men among the common tiers. This man had many servants, yet he cared for them. The Bible says that this one who was sick was dear to him and was ready to die. We also know that he was a man of faith. “When he heard of Jesus, he sent unto him the elders of the Jews, beseeching him that he would come and heal his servant.”. This was a good man, not your typical hostile, Roman centurion. He was sympathetic to Jews and even built a synagogue for the Jewish people. Then Jesus went with them. And when he was now not far from the house, the centurion sent friends to him, saying unto him, Lord, trouble not thyself: for I am not worthy that thou shouldest enter under my roof: wherefore neither thought I myself worthy to come unto thee: but say in a word, and my servant shall be healed. For I also am a man set under authority, having under me soldiers, and I say unto one, Go, and he goeth; and to another, Come, and he cometh; and to my servant, Do this, and he doeth it. When Jesus heard these things, he marvelled at him, and turned him about, and said unto the people that followed him, I say unto you, I have not found so great faith, no, not in Israel. And they that were sent, returning to the house, found the servant whole that had been sick. Interestingly we see that the two miracles of Jesus surrounding this one, (the healing of the multitudes and the raising of the widow of Nain’s son), were performed by a touch of Jesus and by His presence. This miracle of healing was not caused by Jesus presence, for the centurion felt unworthy to have the Son of God enter his house. This miracle was performed through faith in the word of Jesus. This centurion caused the Son of God to marvel. Think about that. It says that Jesus marveled at him having not found faith like that in all of Israel. And here we see great faith in a gentile, in a Roman centurion who has authority over many men. When this centurion said to Jesus through his servants, “For I also am a man set under authority, having under me soldiers, and I say unto one, Go, and he goeth; and to another, Come, and he cometh; and to my servant, Do this, and he doeth it.”, he was comparing himself to Christ. He recognized that Jesus was under authority from God the Father, that He had power to say to the sickness “flee”, and it would flee. This man believed that Christ could heal his servant with a word. He didn’t need a magical touch, just a single word from the one who spoke the earth into existence. Jesus is the Word, and the faith of this centurion healed his servant. I love that the parable of the wise and foolish men occurs exactly one verse before this story. It’s almost as if Jesus is showing us an example of what He just said. This man has built a house on faith, on a solid rock. He is respected amongst the Jews and Romans, he is kind to his servants and generous with his wealth. He is a good man with a solid foundation for his house and his family. Because he has set his foundation upon the rock, when storms come, he has faith that a word from the Master can calm them every time. A life in the mind of Jared Allen is interesting. Living inside of my own body is a strange experience when I look at life from the outside. For me, nothing is too absurd… nothing is too ridiculous. Having this perspective, the complexities of life don’t surprise or puzzle me. The absurdities of life, the minute details, the little things excite, perplex, and bewilder me. This is the second in a trilogy of posts ideas derived from Facebook comments. Today’s is about the theory that nothing is too absurd. I wholeheartedly believe that nothing, nothing is too absurd: everything is just as absurd as it should be. The proportions of absurdity are correct in all things and only the measure of perception varies. Now, simply because things can never be too absurd doesn’t mean things cannot be too stupid. When someone says “There is no such thing as a stupid question”, they are lying to your face. Any question that is asked me that Siri could answer in as much time or less, is a stupid question; unless the motive of the question was not in the answer but in the person from which it came. I get stupid questions asked to me all of the time. Questions like, “Do you have a Sharpie”, or “Do you have your keys?”, both of these items are things I am reputed for having on my person at all times. I haven’t gone a day since 2012 that I didn’t have a Sharpie with me. Rarely if I have bus keys, car keys, or hotel room keys will they ever be absent from me. Those are stupid questions because my family already knows the answers to them. All they have to do is pause a second and think. Some questions are just stupid. However, absurd is a little different. Absurdity is something so ridiculous or impossible that you would never think it could happen. Absurdity towards people comes in the form a request rather than a question. People don’t often care for absurd requests because they are so impossible to accomplish. But God, He loves absurd requests, (are you ready for this? ), nothing is too absurd for God. God wants your absurd requests, He wants your impossible dreams and plans. He wants you to make ridiculous requests of Him so that He can amaze you with the results. God loves to do the impossible to shew forth His glory and might. So, ask. Nothing is too absurd for God. Give Him your hopes, dreams, future, and impossibilities. Let Him make them possibilities. As always, thanks for reading, and a big thanks to Facebook for the ideas. 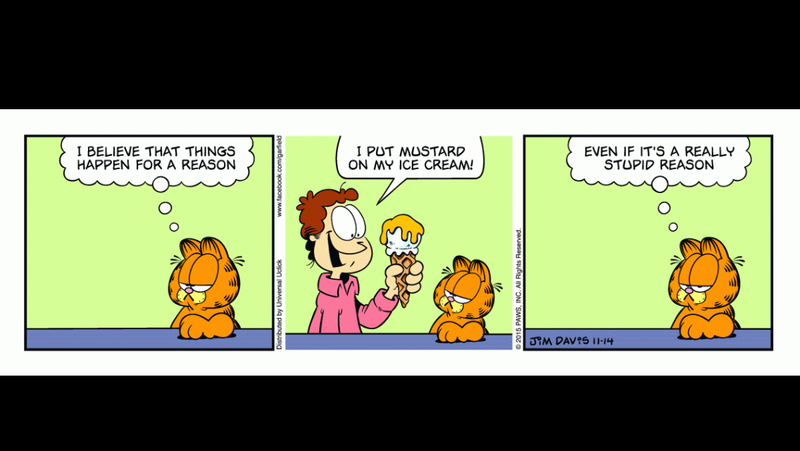 Random Garfield comics are back! At least for today they are. Again, they have no bearing whatsoever on the post, at least not intentionally. Enjoy. Energy: we cannot create it or destroy it. Energy has always existed since the beginning of the world, and there is a limited supply of it. Energy is the force by which all things exist, it moves in and through us, sustaining life, action, heat, and light; thereby also sustaining color, sound, feel, taste, smell, emotion, gravity, and everything else that is. Energy has to be activated, it is stored within all living things and needs to be released in order to work it’s full power and potential. This is the first law of thermodynamics. Wood, as in the most common kind that often gets burned in campfires, stores and immense amount of energy. When lit, the energy is released and creates heat. Energy has to be ignited to be activated. I don’t want to talk about science, at least not right now. I want to talk about spiritual thermodynamics. In every human there is stored a wealth of potential energy. From the moment they are born, they have the potential to be a power source. However, before the energy can be released or activated, it must be ignited by some outside source. Let’s use The Holy Spirit as a for instant: when you get saved, that is to say, when you become cognizant of your depraved condition, repent of your transgressions against God, and get radically rescued from sin, the Holy Spirit takes up residence in your life; He ignites you. Energy once ignited is no longer potential energy, (having a concealed power), but kenetic energy and is moving and active. But, as the energy expends from the firewood, the flames subside until ash is all that remains. The heart is a furnace, it is our responsibility to keep it stocked with spiritual kindling: the preparation for the blaze. When we prepare our hearts for the Holy Spirit, He comes and sets aflame the embers of our souls to burn for Christ. God’s gift to man is grace. What is grace? Everything that man does not deserve and could never earn: grace. Happiness, joy, peace, fulfillment, security, hope, it’s all a product of a life lived for Christ. Those gifts are grace and they come when we decide to live alive and full of energy. When the Holy Spirit ignites the fires of our heart, that’s grace, because every good gift from the Father comes from that. So, when energy is set ablaze in our lives, we become active for Christ and in motion: that’s kenetic energy. Once we are in motion for Christ we can tell others about how they can unleash their inner fire, which is potential energy. Stock the store house of your life and keep the furnace filled with kindling. That’s grace according to thermodynamics. As always, thanks for reading, enjoy your Sunday, and go unleash your potential energy. Ah! My eyes… I can’t see. What-, what happened. Why can’t I see anything…? Wait, I hit my head. Och! Ouch, that hurts… Is it bleeding? I can’t tell, I can’t see me hand in front of my face. What’s going on? I hear a rooster crowing in the distance. It must be morning. But, then it should be seeing light, I should be able to see… Oh no! No! I remember it all now. My eyes! They took out my eyes! I knelt down on the cold, stone floor of the cell in which they had cast me, holding my hands over the bloody sockets where my eyes used to be. I was blind. Oh, how did I ever end up like this.. Wait-, I remember. It was that woman, Delilah. She asked me about my power, my great strength. She plagued me, day in and day out, over and over, constantly until I was to the point of killing myself. When I could take it no more, I told her, it was my hair. If she cut my hair I would be as other men, no great strength, no supernatural power. So she cut my hair and set the Philistine dogs upon me. I didn’t want to tell her, but I couldn’t help myself, I would have died if I had to listen to one more day of her nagging. So, the Philistines took me, bound me, gouged out my eyes, and threw me in a cell. The cowards. So, here I sit, in a stinking cell. Blood is falling from where my eyes once were, and I have this overwhelming sense of failure. I’ve failed my God. I have been selfish, self-centered, spiteful, and hot-headed. I’m sorry Lord, forgive me. Clank! Clank! Someone’s turning a key in the door of this cell. Now footsteps, I hear footsteps. “Hey, get your hands off me!” I flared back at the soldiers with my elbows, but there was no strength in them. I was helpless. “Yeah, go ahead strong man. Not so strong anymore, huh?” A gruff voiced Philistine said as he delivered a hard kick to my side. I double over in pain, clutching my side with both hands and groaning. “Come on, freak, it’s time for the fun.” The soldiers laughed darkly, I could only guess what torment awaited me next. They grabbed me by my arms and drug me out of the cell. So, this was the end. When I awoke, my head ached again and I could hear the sounds of laughter and jeering all around me. My arms were spread apart and my wrists were chained to pillars. I could wrap my arms around the pillars, they were that close to me. Cold voices of merriment and drunken babbling echoed around me. I was in some kind of stone structure, flat roofed based upon how loud the room was. Sound travelled rather quickly here. I heard voices above me also, but outside. There must have been men on the roof. By the way everyone spoke to each other there were many prominent nobles here. I was sport to them, the big joke. Samson the mighty brought down by the great Philistines. What a show of arrogance against God Almighty. I turned my face to heaven and repented. As I cried out unto the Lord, I felt his power flow through me. The fibers of my arms and legs were awakened. Fire spread through my veins like acid, burning the weakness away, filling me with the power of The Living God. Bending my head down, I wrapped my arms around the pillars and leaned down, pulling the pillars with me. With all of my might I leaned against the pillars and broke them. The very foundation of the building crumbled, the roof collapsed killing every Philistine. Then, it was over. The story of Samson is exciting from birth to death, but is by no means fulfilling. It’s seems to have no happy ever after to it. But, the words of Christ ring clear through Samson’s life: he who lives by the sword shall die by the sword. He who lives for revenge, revenge shall be his end. Judges in the Bible did not serve the same purpose as judges do today. A judge in the here and now is a channel to pronounce penalties upon those who break the laws. Judges in the Bible did likewise, but also were the means of carrying out that judgment. Samson judged Israel with the sword, or the donkey’s jawbone, as he preferred. He was the means of enacting judgement. In his life he slew many cruel Philistines, but in his death, in his humbled and weakened state, he slew more than he did in life. Many prominent Philistines were killed that day and Samson was immortalized as the strongest man to ever live. But, remember that living by the sword always comes with a price. In Samson’s case it cost him his life, in the most literal sense possible. Samson did not get to enjoy life, his adult years were spent drinking, having relationships, and killing. His wife was killed, he was constantly being hunted or nagged; his life is one that no man wishes to have, but he chose that life for himself. Actions always have consequences, but no matter how badly you fail, God can still use you; even if it’s going down in an avalanche of glory like Samson. As always, thanks for reading, you people are the best followers in the world. Leave me comments, share your stories, I’d love to hear from you.